So…the question of the summer: how does your garden look? Hopefully lush with colorful vegetables and maybe some fruits. Any maybe more than you can handle? To save all that extra produce you just cannot eat in time, I suggest learning about food preservation. Keep reading for more on canning, freezing, and drying. Home canning is becoming popular again, with new generations learning to can their own foods. When jars of food are heated, several things happen to keep foods preserved: a) enzymes are deactivated that would deteriorate food, b) most bacteria and microorganisms that spoil food and/or make us sick are destroyed, and c) air that aids in decomposition is forced out of jars. Most foods can be preserved via canning, but make sure to use the correct method for the type of food you can: boiling water bath or pressure canning. To can via a boiling water bath, jars of food are placed inside a bath of boiling water and processed for a certain amount of time at a boil. Since water boils at a temperature of 212°F, most molds, yeasts and bacteria are destroyed that would cause spoilage. For a visual demonstration, watch Canning Strawberry Jam from our "What's Cookin' with Mary Liz" YouTube series. *Today's tomatoes may have pH values slightly above 4.6. For safety, we must acidify them by adding citric acid, vinegar, or lemon juice. To determine how much acid to add, see this post from the National Center for Home Food Preservation. Pressure canning is reserved for low acid foods, including meats, vegetables, beans, and mixed foods (sauces, soups). In pressure canning, the food in jars are processed under pressure, which allows the foods to reach higher temperatures than boiling water at 212°F. Jars of food are placed inside a pressure canner, brought up to pressure, and processed for a certain amount of time under that pressure. At this higher temperature created by pressure, bacteria and microorganisms more commonly found in low acid foods, like botulism, are destroyed. For a visual demonstration, watch Pressure Canning Green Beans from our "What's Cookin' with Mary Liz" YouTube series. By freezing foods, enzymes are deactivated and most bacteria and microorganisms that would spoil food stop growing or grow very slowly. 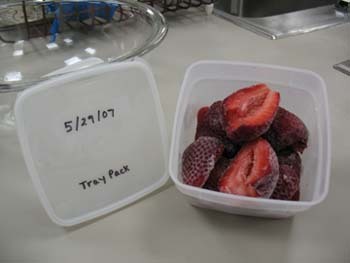 This keeps foods preserved for longer. Most vegetables to be frozen need to be blanched to inactivate enzymes that may lead to off flavors, textures, and colors once frozen. To find out how to do this, check the Freezing page of the National Center for Home Food Preservation. In drying, water is removed from foods. Since bacteria and microorganisms need water, they have a very hard time living on dried foods, letting these foods last longer. 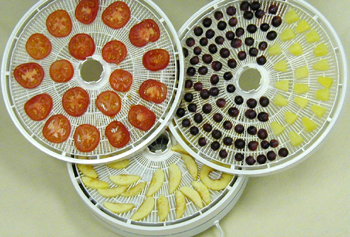 A dehydrator is a great piece of equipment to invest in when considering drying your foods. To find out how to dry different types of food, check the Drying page of the National Center for Home Food Preservation. Boiling water bath canning is a great introduction to get your feet wet if you are new to canning. Try this salsa recipe from the National Center for Home Food Preservation. Remember: use safe, tested recipes like this one and follow all instructions. To read the recipe by itself, follow the link here to the National Center for Home Food Preservation. *This recipe works best with paste tomatoes. Slicing tomatoes require a much longer cooking time to achieve a desirable consistency. **Wear plastic or rubber gloves and do not touch your face while handling or cutting hot peppers. If you do not wear gloves, wash hands thoroughly with soap and water before touching your face or eyes. Hot Pack: Combine all ingredients except cumin, oregano and cilantro in a large saucepot and heat, stirring frequently, until mixture boils. Reduce heat and simmer for 10 minutes, stirring occasionally. Add spices and simmer for another 20 minutes, stirring occasionally. Ladle hot into clean, hot pint jars, leaving ½-inch headspace. Remove air bubbles and adjust headspace if needed. Wipe rims of jars with a dampened, clean paper towel; apply two-piece metal canning lids. Process in a boiling water canner according to the recommendations in Table 1. Table 1. Recommended process time for Tomato Salsa with Paste Tomatoes in a boiling-water canner. Particularly if you are new to any method of food preservation, read reliable information before you start and call your local Extension office to ask questions you may have. That is why we are here! WEB HIGHLIGHT 1: The National Center for Home Food Preservation through the University of Georgia Extension is the go-to resource for all things preservation: http://nchfp.uga.edu/. WEB HIGHLIGHT 3: Have all the canning classes past? Check back in Summer 2015. If you cannot wait until then, consider taking our online 8-module self-paced course "Preserve the Taste of Summer." Register online at http://web.extension.illinois.edu/foodpreservation/ or call your local office. What kind of tomatoes are paste tomatoes? Thank you for writing. Paste tomatoes are typically oval in shape, and are very meaty, with relatively little pulp and seeds. There are hundreds of different paste tomatoes available, both heirloom and hybrid cultivars Some examples of paste tomato varieties are: Roma, Amish Paste, Big Mama, Viva Italia, and Opalka.